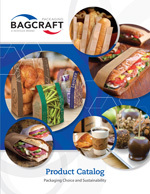 Bagcraft’s flexible paper packaging offers supermarkets a superior solution to meet customers’ demand for convenience and your need for performance and cost efficiency. Our innovative paper based Hot Meal Deli packages will reduce cost, improve food quality, and are often more sustainable than rigid plastic or paperboard alternatives. Eye-catching package designs, creative window containers and colorful graphics help make whatever’s inside more appealing and marketable at the counter, on the shelf or in the display case. You’ll also find our EcoCraft® product line an economical, eco-friendly choice for sustainable packaging. Contact us today, for more information on our supermarket packaging selections, or to locate a representative in your area.